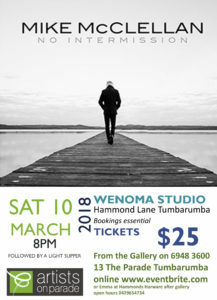 Tumbarumba welcomes well known Australian folk singer/songwriter Mike McClellan for his first concert at Wenoma Studio. Yet again Mike McClellan has an album of wonderful new songs, his third in 5 years. No Intermission was again produced by Matt Fell and continues the remarkable consistency of his later career revival. In reviewing his 2011 album If Only For a Moment… Pat Drummond wrote in Country Update, “a stunning new CD. In the context of a long and illustrious career this is a very special album… for one of Australia’s most influential country/folk legends.” The album that followed, Dancing In The Rain, was regarded as even better. So, where do you rank No Intermission? Steve Britt, writing in Rythms magazine wrote, “I regard this album as the strongest of his latter day albums and easily the equal of his 70s work.” This album, while retaining the very personal nature of his writing also explores a broader range of subject matter than much of his past work. The title track, No Intermission, draws its inspiration from a very intimate, poignant relationship he observed many years ago and uses that observation as a metaphor for the inevitability of change and the need for all of us to pause and reflect on what really matters. That theme runs through many of his songs. The environment, the political landscape, displaced refugees, the decline of trust that appears to infect the faith we share in our institutions and, of course, the nature of love, redemption and change are all themes that he explores with his customary insight and poetic sensibility. Engaging, thoughtful and filled with wonderful melodies it may well come to be regarded as his master work. Supper is included in the tickets.